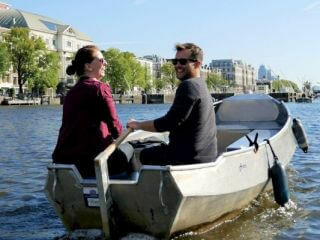 What are the best Amsterdam boat tour deals? A three hour private boat rental with a maximum of 6 people is possible from just € 79, – all-in. The two boat rental companies offering this excellent value for money are Boaty Rent a Boat in ‘De Pijp’ (southern city center) and Boats4rent Boat Hire at the Westerpark (western city center). 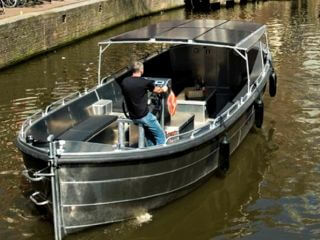 You don’t need a license to rent and drive one of these electric canal boats. Advance online booking is recommended. The cheapest Amsterdam canal cruise is on a large traditional tour boat from Rederij Plas on Damrak, very close to Amsterdam Central Station. 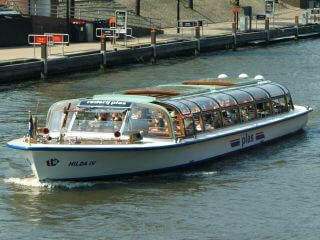 They offer nice one hour city center canal tours. Adults pay € 11,- and children just € 6, -. An interesting harbour cruise of 75 minutes combined with unlimited pancake eating. 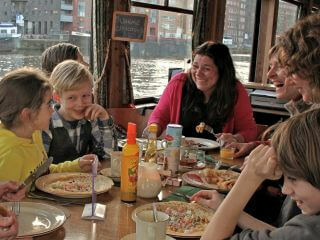 The Amsterdam Pancake Boat a great deal at just € 18,30 for adults and € 13,50 for kids. While you are enjoying the open views, your kids can play in the on board ball pit. 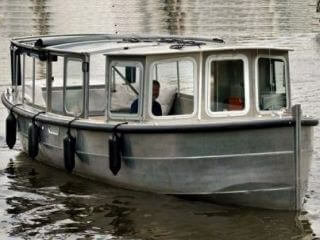 In Amsterdam renting a large boat always comes with a skipper. Generally, that doesn’t come cheap. For large groups this canal boat is an excellent deal, starting at just € 10,- per person at full occupancy for a beautiful two hour private canal tour. The most economic saloon boat for a private canal tour is this newly built ‘Suzanne’. It always comes with a skipper and fits up to 24 people. With that group size you can make a beautiful two hour private canal tour for just € 17 per person. nice boat rides in the port area, for free! At the north side of Central Station there are free public ferries to various destinations in the northern part of Amsterdam, at the other side of the IJ. 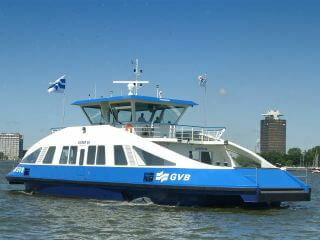 Interesting destinations include the Eye (film museum & cinema), A’dam Tower, NDSM shipyard, Tolhuistuin and Paradiso Noord. It’s allowed to take your bike on board, using the ferries as your gateway to rural Waterland and nice towns like Marken, Monnickendam, Volendam and Edam.